This object owns the MemoryBuffer objects for all of the loaded files and assigns unique FileID's for each unique #include chain. The SourceManager can be queried for information about SourceLocation objects, turning them into either spelling or expansion locations. Spelling locations represent where the bytes corresponding to a token came from and expansion locations represent where the location is in the user's view. In the case of a macro expansion, for example, the spelling location indicates where the expanded token came from and the expansion location specifies where it was expanded. Definition at line 583 of file SourceManager.h. Definition at line 1619 of file SourceManager.h. Definition at line 840 of file SourceManager.h. Definition at line 314 of file SourceManager.cpp. Definition at line 321 of file SourceManager.cpp. Add a line note to the line table for the FileID and offset specified by Loc. AddLineNote - Add a line note to the line table for the FileID and offset specified by Loc. If FilenameID is -1, it is considered to be unspecified. Definition at line 276 of file SourceManager.cpp. Allocate a number of loaded SLocEntries, which will be actually loaded on demand from the external source. NumSLocEntries will be allocated, which occupy a total of TotalSize space in the global source view. The lowest ID and the base offset of the entries will be returned. Definition at line 456 of file SourceManager.cpp. References createFileID(), clang::FileID::isInvalid(), and local_sloc_entry_size(). Definition at line 342 of file SourceManager.cpp. Return a new SourceLocation that encodes the fact that a token from SpellingLoc should actually be referenced from ExpansionLoc. Definition at line 576 of file SourceManager.cpp. Referenced by clearIDTables(), clang::Lexer::Create_PragmaLexer(), clang::Preprocessor::CreateString(), clang::ASTImporter::Import_New(), clang::TokenLexer::Init(), isTargetEnvironment(), isTrivialSingleTokenExpansion(), and clang::TokenLexer::Lex(). Create a new FileID that represents the specified file being #included from the specified IncludePosition. This translates NULL into standard input. Definition at line 818 of file SourceManager.h. Referenced by AllocateLoadedSLocEntries(), clang::tooling::applyAllReplacements(), applyEditsToTemp(), clang::FrontendAction::BeginSourceFile(), ConvertBackendLocation(), clang::index::SimpleFormatContext::createInMemoryFile(), clang::Preprocessor::EnterMainSourceFile(), clang::ScratchBuffer::getToken(), clang::ASTImporter::Import_New(), and clang::CompilerInstance::InitializeSourceManager(). This does no caching of the buffer and takes ownership of the MemoryBuffer, so only pass a MemoryBuffer to this once. Definition at line 831 of file SourceManager.h. Definition at line 846 of file SourceManager.h. Return a new SourceLocation that encodes the fact that a token from SpellingLoc should actually be referenced from ExpansionLoc, and that it represents the expansion of a macro argument into the function-like macro body. Definition at line 567 of file SourceManager.cpp. Referenced by clang::ASTImporter::Import_New(), and updateConsecutiveMacroArgTokens(). Return a new SourceLocation that encodes that the token starting at TokenStart ends prematurely at TokenEnd. Definition at line 588 of file SourceManager.cpp. Disable overridding the contents of a file, previously enabled with overrideFileContents. This should be called before parsing has begun. Definition at line 651 of file SourceManager.cpp. Definition at line 2125 of file SourceManager.cpp. Definition at line 1621 of file SourceManager.h. Definition at line 1622 of file SourceManager.h. If there is an error opening this buffer the first time, this manufactures a temporary buffer and returns a non-empty error string. Definition at line 956 of file SourceManager.h. References clang::SrcMgr::ContentCache::getBuffer(), clang::SrcMgr::FileInfo::getContentCache(), clang::SrcMgr::SLocEntry::getFile(), and clang::SrcMgr::SLocEntry::isFile(). Referenced by clang::html::AddHeaderFooterInternalBuiltinCSS(), clang::html::AddLineNumbers(), clang::Lexer::Create_PragmaLexer(), clang::CreateModernObjCRewriter(), clang::CreateObjCRewriter(), DetectEOL(), clang::html::EscapeText(), clang::CodeGenAction::ExecuteAction(), clang::DumpRawTokensAction::ExecuteAction(), clang::PrintPreprocessedAction::ExecuteAction(), findDirectives(), clang::format::FormatTokenLexer::FormatTokenLexer(), getBufferName(), getColumnNumber(), getLengthOnSingleLine(), clang::html::HighlightMacros(), isBeforeInTranslationUnit(), isBisonFile(), clang::format::FormatTokenLexer::lex(), LexRawTokensFromMainFile(), clang::RewriteIncludesInInput(), clang::DiagnosticsEngine::SetDelayedDiagnostic(), clang::html::SyntaxHighlight(), and clang::TokenRewriter::TokenRewriter(). Definition at line 971 of file SourceManager.h. FID The file ID whose contents will be returned. Invalid If non-NULL, will be set true if an error occurred. Definition at line 669 of file SourceManager.cpp. References clang::CharSourceRange::getBegin(), clang::SrcMgr::ContentCache::getBuffer(), clang::SrcMgr::FileInfo::getContentCache(), getDecomposedLoc(), clang::SrcMgr::SLocEntry::getExpansion(), clang::SrcMgr::ExpansionInfo::getExpansionLocStart(), clang::SrcMgr::SLocEntry::getFile(), getFileID(), getImmediateExpansionRange(), getImmediateSpellingLoc(), getLoadedSLocEntry(), getLocalSLocEntry(), clang::SourceLocation::getLocWithOffset(), clang::SrcMgr::SLocEntry::getOffset(), getSLocEntry(), clang::SrcMgr::ExpansionInfo::getSpellingLoc(), clang::SrcMgr::SLocEntry::isExpansion(), clang::SrcMgr::SLocEntry::isFile(), clang::SourceLocation::isFileID(), isMacroArgExpansion(), and Offset. Referenced by clang::arcmt::trans::MigrationContext::addPropertyAttribute(), adjustRemoval(), clang::CreateModernObjCRewriter(), clang::CreateObjCRewriter(), clang::Lexer::findNextToken(), clang::arcmt::trans::findSemiAfterLocation(), clang::tooling::formatAndApplyAllReplacements(), getBeginningOfFileToken(), clang::Lexer::getImmediateMacroName(), clang::Lexer::getImmediateMacroNameForDiagnostics(), clang::Lexer::getIndentationForLine(), clang::StringLiteral::getLocationOfByte(), clang::ASTContext::getRawCommentForDeclNoCache(), clang::Lexer::getRawToken(), clang::Lexer::getSourceText(), clang::Lexer::getSpelling(), clang::comments::Lexer::getSpelling(), clang::html::HighlightRange(), LocPropertyAttribute(), onlyWhitespaceBetween(), clang::RawComment::RawComment(), clang::edit::Commit::replaceText(), clang::arcmt::trans::MigrationContext::rewritePropertyAttribute(), and clang::Preprocessor::SplitToken(). Note that this name does not respect #line directives. Use getPresumedLoc for normal clients. Definition at line 1401 of file SourceManager.cpp. References getBuffer(), getFileID(), and isInvalid(). Referenced by clang::Preprocessor::CheckMacroName(), clang::CodeGen::CodeGenModule::EmitAnnotationUnit(), and clang::CoverageSourceInfo::SourceRangeSkipped(). Return a pointer to the start of the specified location in the appropriate spelling MemoryBuffer. getCharacterData - Return a pointer to the start of the specified location in the appropriate MemoryBuffer. Invalid If non-NULL, will be set true if an error occurs. Definition at line 1093 of file SourceManager.cpp. References clang::SrcMgr::ContentCache::getBuffer(), clang::SrcMgr::FileInfo::getContentCache(), getDecomposedSpellingLoc(), clang::SrcMgr::SLocEntry::getFile(), getSLocEntry(), and clang::SrcMgr::SLocEntry::isFile(). Referenced by addFixitForObjCARCConversion(), clang::arcmt::ObjCMigrateAction::BeginInvocation(), clang::Lexer::Create_PragmaLexer(), clang::Preprocessor::DumpToken(), clang::Lexer::findLocationAfterToken(), fixItNullability(), GetFirstChar(), clang::Lexer::getSpelling(), clang::Preprocessor::getSpellingOfSingleCharacterNumericConstant(), clang::Lexer::getTokenPrefixLength(), clang::VerifyDiagnosticConsumer::HandleComment(), isSameWidthConstantConversion(), IsStringPrefix(), mustSynthesizeSetterGetterMethod(), clang::Parser::ParseConstraintExpression(), RewriteOneForwardClassDecl(), scanToNextArgument(), and Write_RethrowObject(). getColumnNumber - Return the column # for the specified file position. This is significantly cheaper to compute than the line number. This returns zero if the column number isn't known. This may only be called on a file sloc, so you must choose a spelling or expansion location before calling this method. this is significantly cheaper to compute than the line number. Definition at line 1118 of file SourceManager.cpp. Referenced by buildFixItInsertionLine(), getExpansionColumnNumber(), getPresumedLoc(), and getSpellingColumnNumber(). Definition at line 1183 of file SourceManager.h. References clang::SrcMgr::SLocEntry::getOffset(), clang::SrcMgr::SLocEntry::isFile(), and Offset. Referenced by getNumberOfModules(), and clang::ASTImporter::Import_New(). Definition at line 1520 of file SourceManager.h. Return the amount of memory used for various side tables and data structures in the SourceManager. Definition at line 2204 of file SourceManager.cpp. If the location is an expansion record, walk through it until we find the final location expanded. Definition at line 1212 of file SourceManager.h. References clang::SrcMgr::SLocEntry::getOffset(), clang::SourceLocation::isFileID(), and Offset. Referenced by buildFixItInsertionLine(), getExpansionColumnNumber(), getExpansionLineNumber(), getFileCharacteristic(), getPresumedLoc(), isGCCAsmStatement(), isInMainFile(), and ReadLineMarkerFlags(). Returns the "included/expanded in" decomposed location of the given FileID. Definition at line 1918 of file SourceManager.cpp. References getDecomposedLoc(), clang::SrcMgr::SLocEntry::getExpansion(), clang::SrcMgr::ExpansionInfo::getExpansionLocStart(), clang::SrcMgr::SLocEntry::getFile(), clang::SrcMgr::FileInfo::getIncludeLoc(), getSLocEntry(), clang::SrcMgr::SLocEntry::isExpansion(), clang::FileID::isInvalid(), and clang::SourceLocation::isValid(). Referenced by MoveUpIncludeHierarchy(), and clang::DiagnosticsEngine::SetDelayedDiagnostic(). Definition at line 1198 of file SourceManager.h. Referenced by clang::ASTUnit::addFileLevelDecl(), clang::arcmt::trans::MigrationContext::addPropertyAttribute(), buildFixItInsertionLine(), clang::TextDiagnostic::emitDiagnosticLoc(), clang::Lexer::findNextToken(), clang::arcmt::trans::findSemiAfterLocation(), getBeginningOfFileToken(), clang::Lexer::GetBeginningOfToken(), getBufferData(), clang::ASTWriter::getDeclID(), getDecomposedIncludedLoc(), clang::Lexer::getImmediateMacroName(), clang::Lexer::getImmediateMacroNameForDiagnostics(), getImmediateSpellingLoc(), clang::Lexer::getIndentationForLine(), clang::StringLiteral::getLocationOfByte(), getMacroArgExpandedLocation(), getRangeSize(), clang::ASTContext::getRawCommentForDeclNoCache(), clang::Lexer::getRawToken(), clang::Lexer::getSourceText(), clang::Lexer::getSpelling(), clang::comments::Lexer::getSpelling(), hasSuperInitCall(), clang::ASTImporter::Import_New(), isAtStartOfImmediateMacroExpansion(), isBeforeInTranslationUnit(), isFunctionMacroExpansion(), clang::format::FormatTokenLexer::lex(), loadModuleMapForModuleBuild(), LocPropertyAttribute(), makeRangeFromFileLocs(), clang::Sema::notePreviousDefinition(), onlyWhitespaceBetween(), clang::tooling::operator==(), printLoc(), clang::RawComment::RawComment(), clang::edit::Commit::replaceText(), clang::arcmt::trans::MigrationContext::rewritePropertyAttribute(), clang::DiagnosticsEngine::SetDelayedDiagnostic(), clang::Preprocessor::SplitToken(), and translateLineCol(). If the location is an expansion record, walk through it until we find its spelling record. Definition at line 1231 of file SourceManager.h. Referenced by getCharacterData(), getSpellingColumnNumber(), and getSpellingLineNumber(). Definition at line 758 of file SourceManager.h. Referenced by clang::Decl::dump(), clang::DeclContext::dumpLookups(), findDirectives(), and getTargetEntryUniqueInfo(). Definition at line 1180 of file SourceManager.cpp. References getColumnNumber(), getDecomposedExpansionLoc(), and isInvalid(). Referenced by createTextRegion(), EmitAlphaCounter(), highlightRange(), outputPrintable(), and printLocation(). Definition at line 1349 of file SourceManager.cpp. References getDecomposedExpansionLoc(), getLineNumber(), and isInvalid(). Referenced by CompactMacroExpandedPieces(), createTextRegion(), EmitAlphaCounter(), clang::CodeGen::CodeGenModule::EmitAnnotationLineNo(), findLinesForRange(), highlightRange(), printLocation(), and RewriteOneForwardClassDecl(). Given a SourceLocation object Loc, return the expansion location referenced by the ID. Definition at line 1119 of file SourceManager.h. Referenced by clang::markup::AddFID(), clang::AttachDependencyGraphGen(), clang::DependencyFileGenerator::AttachToASTReader(), CompactMacroExpandedPieces(), clang::CreateModernObjCRewriter(), clang::CreateObjCRewriter(), EmitAlphaCounter(), clang::TextDiagnostic::emitDiagnosticLoc(), clang::markup::EmitLocation(), clang::Sema::findMacroSpelling(), clang::markup::GetFID(), getLengthOnSingleLine(), clang::Preprocessor::getModuleForLocation(), clang::Preprocessor::getModuleHeaderToIncludeForDiagnostics(), getNullabilityCompletenessCheckFileID(), clang::ASTContext::getRawCommentForDeclNoCache(), clang::Lexer::getRawToken(), clang::diff::SyntaxTree::getSourceRangeOffsets(), clang::VerifyDiagnosticConsumer::HandleDiagnostic(), clang::ento::PathDiagnosticConsumer::HandlePathDiagnostic(), clang::html::HighlightMacros(), clang::html::HighlightRange(), clang::TokenLexer::Init(), clang::SourceLocation::print(), printLoc(), clang::RewriteMacrosInInput(), clang::tooling::Transformer::run(), scanToNextArgument(), and toLevel(). Given a SourceLocation object, return the range of tokens covered by the expansion in the ultimate file. getExpansionRange - Given a SourceLocation object, return the range of tokens covered by the expansion in the ultimate file. Definition at line 977 of file SourceManager.cpp. 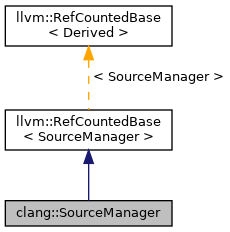 References clang::CharSourceRange::getBegin(), clang::CharSourceRange::getEnd(), getImmediateExpansionRange(), clang::SourceLocation::isFileID(), clang::CharSourceRange::isTokenRange(), clang::CharSourceRange::setBegin(), clang::CharSourceRange::setEnd(), and clang::CharSourceRange::setTokenRange(). Referenced by clang::TextDiagnostic::emitDiagnosticLoc(), getLengthOnSingleLine(), clang::html::HighlightMacros(), isTargetEnvironment(), and clang::arcmt::writeARCDiagsToPlist(). Given a SourceRange object, return the range of tokens or characters covered by the expansion in the ultimate file. Definition at line 1146 of file SourceManager.h. References Begin, End, clang::SourceRange::getBegin(), clang::SourceRange::getEnd(), clang::CharSourceRange::getEnd(), and clang::CharSourceRange::isTokenRange(). Given a CharSourceRange object, return the range of tokens or characters covered by the expansion in the ultimate file. Definition at line 1155 of file SourceManager.h. References clang::CharSourceRange::getAsRange(), clang::CharSourceRange::getEnd(), clang::CharSourceRange::isTokenRange(), and clang::CharSourceRange::setTokenRange(). Return the file characteristic of the specified source location, indicating whether this is a normal file, a system header, or an "implicit extern C" system header. getFileCharacteristic - return the file characteristic of the specified source location, indicating whether this is a normal file, a system header, or an "implicit extern C" system header. which changes all source locations in the current file after that to be considered to be from a system header. Definition at line 1371 of file SourceManager.cpp. References clang::SrcMgr::C_User, clang::LineEntry::FileKind, clang::LineTableInfo::FindNearestLineEntry(), getDecomposedExpansionLoc(), clang::SrcMgr::SLocEntry::getFile(), clang::SrcMgr::FileInfo::getFileCharacteristic(), getSLocEntry(), clang::SrcMgr::FileInfo::hasLineDirectives(), clang::SrcMgr::SLocEntry::isFile(), and clang::SourceLocation::isValid(). Definition at line 988 of file SourceManager.h. References clang::SrcMgr::FileInfo::getContentCache(), clang::SrcMgr::SLocEntry::getFile(), clang::SrcMgr::SLocEntry::isFile(), and clang::SrcMgr::ContentCache::OrigEntry. Referenced by clang::arcmt::MigrationProcess::applyTransform(), clang::tooling::AtomicChange::AtomicChange(), clang::AttachDependencyGraphGen(), clang::DependencyFileGenerator::AttachToASTReader(), clang::PrecompiledPreamble::Build(), compareCrossTUSourceLocs(), clang::ModuleMap::createModuleForInterfaceUnit(), DetectEOL(), clang::Preprocessor::EnterMainSourceFile(), clang::sema::SemaPPCallbacks::FileChanged(), clang::ModuleMap::getContainingModuleMapFile(), clang::PreprocessorLexer::getFileEntry(), clang::Lexer::getImmediateMacroNameForDiagnostics(), clang::Preprocessor::getModuleForLocation(), clang::Preprocessor::getModuleHeaderToIncludeForDiagnostics(), clang::LogDiagnosticPrinter::HandleDiagnostic(), clang::VerifyDiagnosticConsumer::HandleDiagnostic(), hasSuperInitCall(), IsFromSameFile(), clang::CodeGen::CodeGenModule::isInSanitizerBlacklist(), clang::Preprocessor::isPCHThroughHeader(), isTargetEnvironment(), clang::Preprocessor::LookupFile(), clang::Sema::notePreviousDefinition(), clang::tooling::operator==(), prepareToBuildModule(), printLoc(), PrintUnexpected(), clang::CodeGen::CGDebugInfo::remapDIPath(), clang::VerifyDiagnosticConsumer::UpdateParsedFileStatus(), and clang::arcmt::writeARCDiagsToPlist(). Definition at line 1001 of file SourceManager.h. References clang::SrcMgr::FileInfo::getContentCache(), clang::SrcMgr::SLocEntry::getFile(), and clang::SrcMgr::ContentCache::OrigEntry. This is a very hot method that is used for all SourceManager queries that start with a SourceLocation object. It is responsible for finding the entry in SLocEntryTable which contains the specified location. Definition at line 1050 of file SourceManager.h. Referenced by clang::CodeGen::CodeGenModule::AddDeferredUnusedCoverageMapping(), clang::markup::AddFID(), clang::AttachDependencyGraphGen(), clang::DependencyFileGenerator::AttachToASTReader(), AuditedType(), checkConfigMacro(), checkObjCUnusedIvar(), CompactMacroExpandedPieces(), clang::Lexer::Create_PragmaLexer(), createTokenSplitLoc(), DiagnoseNullConversion(), EmitAlphaCounter(), EvaluateDefined(), clang::sema::SemaPPCallbacks::FileChanged(), findLinesForRange(), clang::tooling::findSelectedASTNodes(), getBufferData(), getBufferName(), clang::ModuleMap::getContainingModuleMapFile(), clang::markup::GetFID(), getImmediateExpansionRange(), clang::Lexer::getImmediateMacroName(), clang::Lexer::getImmediateMacroNameForDiagnostics(), getLengthOnSingleLine(), getMacroArgExpansionFileIDs(), clang::Preprocessor::getModuleForLocation(), clang::Preprocessor::getModuleHeaderToIncludeForDiagnostics(), getNullabilityCompletenessCheckFileID(), clang::ScratchBuffer::getToken(), clang::LogDiagnosticPrinter::HandleDiagnostic(), clang::VerifyDiagnosticConsumer::HandleDiagnostic(), clang::ento::PathDiagnosticConsumer::HandlePathDiagnostic(), hasSuperInitCall(), clang::html::HighlightMacros(), clang::html::HighlightRange(), highlightRange(), clang::ASTImporter::Import_New(), clang::index::IndexingContext::importedModule(), isArgumentExpandedFromMacro(), isAtEndOfImmediateMacroExpansion(), IsFromSameFile(), clang::ento::AnalysisManager::isInCodeFile(), isMacroArgExpansion(), isMacroBodyExpansion(), clang::TokenLexer::Lex(), clang::Lexer::makeFileCharRange(), mapDiagnosticRanges(), PrintUnexpected(), retrieveMacroLocation(), Scan(), shouldIgnoreMacro(), shouldReportOccurrenceForSystemDeclOnlyMode(), clang::CoverageSourceInfo::SourceRangeSkipped(), and UseNSOptionsMacro(). Definition at line 1510 of file SourceManager.cpp. References getNextLocalOffset(), clang::SrcMgr::SLocEntry::getOffset(), getSLocEntry(), and local_sloc_entry_size(). Referenced by DetectEOL(), clang::CoverageSourceInfo::SourceRangeSkipped(), and translateLineCol(). Given Loc, if it is a macro location return the expansion location or the spelling location, depending on if it comes from a macro argument or not. Definition at line 1129 of file SourceManager.h. Referenced by clang::ASTUnit::addFileLevelDecl(), clang::ASTReader::FindExternalLexicalDecls(), clang::ASTWriter::getDeclID(), clang::index::IndexingContext::importedModule(), clang::SanitizerBlacklist::isBlacklistedLocation(), isPreprocessedEntityIfInFileID(), makeStandaloneDiagnostic(), clang::index::FileIndexRecord::print(), clang::XRayFunctionFilter::shouldImbueLocation(), and shouldReportOccurrenceForSystemDeclOnlyMode(). Definition at line 760 of file SourceManager.h. Referenced by clang::tooling::Replacement::apply(), clang::tooling::RefactoringTool::applyAllReplacements(), clang::tooling::formatAndApplyAllReplacements(), clang::SrcMgr::ContentCache::getBuffer(), clang::cross_tu::CrossTranslationUnitContext::getCrossTUDefinition(), clang::cross_tu::CrossTranslationUnitContext::importDefinition(), clang::ModuleMap::inferFrameworkModule(), clang::ModuleMap::isBuiltinHeader(), clang::ModuleMap::isHeaderUnavailableInModule(), clang::ASTWriter::PreparePathForOutput(), clang::TextDiagnostic::printDiagnosticMessage(), and clang::ModuleMap::setUmbrellaHeader(). Definition at line 1061 of file SourceManager.h. Referenced by clang::tooling::DiagnosticMessage::DiagnosticMessage(), clang::SanitizerBlacklist::isBlacklistedLocation(), clang::ento::AnalysisManager::isInCodeFile(), makeStandaloneDiagnostic(), clang::Sema::notePreviousDefinition(), PrintExpected(), and clang::XRayFunctionFilter::shouldImbueLocation(). This is not very meaningful for a macro ID. Definition at line 1252 of file SourceManager.h. Referenced by DetectEOL(), clang::tooling::DiagnosticMessage::DiagnosticMessage(), getLengthOnSingleLine(), clang::diff::SyntaxTree::getSourceRangeOffsets(), clang::html::HighlightRange(), clang::format::FormatTokenLexer::lex(), makeStandaloneDiagnostic(), makeStandaloneRange(), clang::RewriteMacrosInInput(), clang::CoverageSourceInfo::SourceRangeSkipped(), and clang::html::SyntaxHighlight(). getImmediateExpansionRange - Loc is required to be an expansion location. Loc is required to be an expansion location. Return the start/end of the expansion information. Definition at line 963 of file SourceManager.cpp. References clang::SrcMgr::SLocEntry::getExpansion(), clang::SrcMgr::ExpansionInfo::getExpansionLocRange(), getFileID(), getSLocEntry(), and clang::SourceLocation::isMacroID(). Referenced by checkAllAtProps(), CheckMoveOnConstruction(), DiagnoseNullConversion(), getBufferData(), getExpansionRange(), clang::Lexer::getImmediateMacroName(), clang::Lexer::getImmediateMacroNameForDiagnostics(), getMacroArgExpansionFileIDs(), handleObjCOwnershipTypeAttr(), isFunctionMacroExpansion(), clang::TokenLexer::Lex(), mapDiagnosticRanges(), retrieveMacroLocation(), and clang::CoverageSourceInfo::SourceRangeSkipped(). Gets the location of the immediate macro caller, one level up the stack toward the initial macro typed into the source. Definition at line 1703 of file SourceManager.h. Referenced by getTopMostMacro(), isArgumentExpandedFromMacro(), IsFromSameFile(), IsInAnyMacroBody(), and isOriginMacroBody(). Given a SourceLocation object, return the spelling location referenced by the ID. getImmediateSpellingLoc - Given a SourceLocation object, return the spelling location referenced by the ID. This is the first level down towards the place where the characters that make up the lexed token can be found. This should not generally be used by clients. Definition at line 953 of file SourceManager.cpp. References getDecomposedLoc(), clang::SrcMgr::SLocEntry::getExpansion(), clang::SourceLocation::getLocWithOffset(), getSLocEntry(), clang::SrcMgr::ExpansionInfo::getSpellingLoc(), and clang::SourceLocation::isFileID(). Referenced by getBufferData(), getMacroArgExpansionFileIDs(), getTopMacroCallerLoc(), clang::Lexer::makeFileCharRange(), and retrieveMacroLocation(). Returns the include location if FID is a #include'd file otherwise it returns an invalid location. Definition at line 1093 of file SourceManager.h. References clang::SrcMgr::SLocEntry::getFile(), clang::SrcMgr::FileInfo::getIncludeLoc(), and clang::SrcMgr::SLocEntry::isFile(). Referenced by clang::sema::SemaPPCallbacks::FileChanged(), clang::Preprocessor::getModuleHeaderToIncludeForDiagnostics(), clang::ento::AnalysisManager::isInCodeFile(), clang::Sema::notePreviousDefinition(), and clang::CoverageSourceInfo::SourceRangeSkipped(). getLineNumber - Given a SourceLocation, return the spelling line number for the position indicated. This requires building and caching a table of line offsets for the MemoryBuffer, so this is not cheap: use only when about to emit a diagnostic. SourceLineCache for it on demand. Definition at line 1249 of file SourceManager.cpp. References ComputeLineNumbers(), clang::SrcMgr::FileInfo::getContentCache(), clang::SrcMgr::SLocEntry::getFile(), getSLocEntry(), clang::SrcMgr::SLocEntry::isFile(), clang::FileID::isInvalid(), clang::SrcMgr::ContentCache::NumLines, and clang::SrcMgr::ContentCache::SourceLineCache. Referenced by buildFixItInsertionLine(), DetectEOL(), getExpansionLineNumber(), getPresumedLoc(), clang::ASTContext::getRawCommentForDeclNoCache(), getSpellingLineNumber(), and isGCCAsmStatement(). Retrieve the stored line table. Definition at line 304 of file SourceManager.cpp. Return the uniqued ID for the specified filename. getLineTableFilenameID - Return the uniqued ID for the specified filename. Definition at line 269 of file SourceManager.cpp. Definition at line 1646 of file SourceManager.h. Referenced by getBufferData(), and translateFile(). Definition at line 1636 of file SourceManager.h. Referenced by emitBlob(), getBufferData(), and translateFile(). Definition at line 1081 of file SourceManager.h. Referenced by DetectEOL(), clang::format::FormatTokenLexer::lex(), and clang::CoverageSourceInfo::SourceRangeSkipped(). Return the source location corresponding to the first byte of the specified file. Definition at line 1069 of file SourceManager.h. Referenced by clang::Sema::ActOnStartOfTranslationUnit(), clang::html::AddHeaderFooterInternalBuiltinCSS(), clang::arcmt::trans::MigrationContext::addPropertyAttribute(), clang::tooling::Replacement::apply(), applyEditsToTemp(), applyRewrite(), ConvertBackendLocation(), clang::Lexer::Create_PragmaLexer(), clang::CreateModernObjCRewriter(), clang::CreateObjCRewriter(), clang::format::Environment::Environment(), clang::ASTReader::FindFileRegionDecls(), clang::Lexer::findNextToken(), clang::arcmt::trans::findSemiAfterLocation(), clang::edit::Commit::Edit::getFileLocation(), clang::edit::Commit::Edit::getInsertFromRange(), clang::StringLiteral::getLocationOfByte(), getPresumedLoc(), clang::Lexer::getRawToken(), clang::Lexer::getSpelling(), clang::ScratchBuffer::getToken(), LocPropertyAttribute(), clang::arcmt::trans::MigrationContext::rewritePropertyAttribute(), clang::DiagnosticsEngine::SetDelayedDiagnostic(), clang::CoverageSourceInfo::SourceRangeSkipped(), and Write_ProtocolExprReferencedMetadata(). If Loc points inside a function macro argument, the returned location will be the macro location in which the argument was expanded. If a macro argument is used multiple times, the expanded location will be at the first expansion of the argument. e.g. MY_MACRO(foo); ^ Passing a file location pointing at 'foo', will yield a macro location where 'foo' was expanded into. Loc points inside a function macro argument, the returned location will be the macro location in which the argument was expanded. If a macro argument is used multiple times, the expanded location will be at the first expansion of the argument. e.g. MY_MACRO(foo); ^ Passing a file location pointing at 'foo', will yield a macro location where 'foo' was expanded into. Definition at line 1889 of file SourceManager.cpp. References getDecomposedLoc(), clang::SourceLocation::getLocWithOffset(), clang::SourceLocation::isFileID(), clang::FileID::isInvalid(), clang::SourceLocation::isInvalid(), clang::SourceLocation::isValid(), and Offset. Definition at line 794 of file SourceManager.h. Referenced by clang::Sema::ActOnStartOfTranslationUnit(), clang::CodeGen::CodeGenModule::AddDeferredUnusedCoverageMapping(), clang::PrecompiledPreamble::Build(), clang::CreateModernObjCRewriter(), clang::ModuleMap::createModuleForInterfaceUnit(), clang::CreateObjCRewriter(), DetectEOL(), clang::DoRewriteTest(), clang::Preprocessor::EnterMainSourceFile(), clang::CodeGenAction::ExecuteAction(), clang::DumpRawTokensAction::ExecuteAction(), clang::PrintPreprocessedAction::ExecuteAction(), clang::LogDiagnosticPrinter::HandleDiagnostic(), clang::CompilerInstance::InitializeSourceManager(), isBisonFile(), clang::CodeGen::CodeGenModule::isInSanitizerBlacklist(), LexRawTokensFromMainFile(), clang::Preprocessor::LookupFile(), clang::ento::ModelInjector::ModelInjector(), prepareToBuildModule(), ReadOriginalFileName(), clang::CodeGen::CGDebugInfo::remapDIPath(), clang::RewriteIncludesInInput(), and clang::RewriteMacrosInInput(). Retrieve the memory buffer associated with the given file. Invalid If non-NULL, will be set true if an error occurs while retrieving the memory buffer. Definition at line 622 of file SourceManager.cpp. Referenced by clang::PrecompiledPreamble::Build(), and clang::Preprocessor::SetCodeCompletionPoint(). Definition at line 2186 of file SourceManager.cpp. Definition at line 774 of file SourceManager.h. Referenced by compileModuleImpl(), clang::CompilerInstance::loadModule(), and prepareToBuildModule(). Definition at line 1106 of file SourceManager.h. Definition at line 1663 of file SourceManager.h. Referenced by emitBlob(), getFileIDSize(), and clang::TokenLexer::Init(). Get the number of FileIDs (files and macros) that were created during preprocessing of FID, including it. Definition at line 1018 of file SourceManager.h. Otherwise, create a new FileID for the SourceFile. Definition at line 856 of file SourceManager.h. Referenced by clang::tooling::Replacement::apply(), and clang::tooling::formatAndApplyAllReplacements(). Definition at line 808 of file SourceManager.h. Definition at line 1187 of file SourceManager.cpp. References ComputeLineNumbers(), clang::PresumedLoc::getColumn(), getPresumedLoc(), isInvalid(), and SM. Definition at line 1355 of file SourceManager.cpp. References clang::PresumedLoc::getLine(), getPresumedLoc(), and isInvalid(). Referenced by clang::comments::Sema::actOnHTMLEndTag(), CheckLists(), clang::comments::Parser::parseHTMLStartTag(), PrintExpected(), PrintUnexpected(), and ShouldDiagnoseEmptyStmtBody(). getPresumedLoc - This method returns the "presumed" location of a SourceLocation specifies. A "presumed location" can be modified by #line or GNU line marker directives. This provides a view on the data that a user should see in diagnostics, for example. Note that a presumed location is always given as the expansion point of an expansion location, not at the spelling location. The presumed location of the specified SourceLocation. If the presumed location cannot be calculated (e.g., because Loc is invalid or the file containing Loc has changed on disk), returns an invalid presumed location. Definition at line 1415 of file SourceManager.cpp. References clang::C, Filename, clang::LineTableInfo::FindNearestLineEntry(), clang::SrcMgr::ContentCache::getBuffer(), getColumnNumber(), clang::SrcMgr::FileInfo::getContentCache(), getDecomposedExpansionLoc(), clang::SrcMgr::SLocEntry::getFile(), clang::LineTableInfo::getFilename(), clang::SrcMgr::FileInfo::getIncludeLoc(), getLineNumber(), getLocForStartOfFile(), clang::SourceLocation::getLocWithOffset(), clang::FileEntry::getName(), getSLocEntry(), clang::SrcMgr::FileInfo::hasLineDirectives(), clang::SrcMgr::SLocEntry::isFile(), clang::SourceLocation::isInvalid(), and clang::SrcMgr::ContentCache::OrigEntry. Referenced by clang::AttachHeaderIncludeGen(), buildFixItInsertionLine(), clang::CodeGen::SanitizerMetadata::disableSanitizerForInstruction(), clang::DoPrintPreprocessedInput(), clang::TextNodeDumper::dumpLocation(), clang::CodeGen::CodeGenModule::EmitAnnotationLineNo(), clang::CodeGen::CodeGenModule::EmitAnnotationUnit(), clang::CodeGen::CodeGenFunction::EmitCheckSourceLocation(), clang::CodeGen::CGOpenMPRuntime::emitUpdateLocation(), getFunctionSourceLocation(), clang::getParameterABISpelling(), getPresumedColumnNumber(), getPresumedLineNumber(), getTargetEntryUniqueInfo(), clang::LogDiagnosticPrinter::HandleDiagnostic(), isTargetEnvironment(), clang::index::FileIndexRecord::print(), clang::SourceLocation::print(), PrintMacroDefinition(), ReadLineMarkerFlags(), clang::CodeGen::CGDebugInfo::remapDIPath(), and clang::CodeGen::CGDebugInfo::setLocation(). Definition at line 1654 of file SourceManager.h. Referenced by emitBlob(), EvaluateDefined(), getBufferData(), getCharacterData(), clang::ASTWriter::getDeclID(), getDecomposedIncludedLoc(), getFileCharacteristic(), getFileIDSize(), getImmediateExpansionRange(), clang::Lexer::getImmediateMacroName(), getImmediateSpellingLoc(), getLineNumber(), getNullabilityCompletenessCheckFileID(), getPresumedLoc(), clang::ScratchBuffer::getToken(), clang::index::IndexingContext::importedModule(), isAtEndOfImmediateMacroExpansion(), isAtStartOfImmediateMacroExpansion(), isFunctionMacroExpansion(), isInMainFile(), isMacroArgExpansion(), isMacroBodyExpansion(), clang::Lexer::makeFileCharRange(), shouldReportOccurrenceForSystemDeclOnlyMode(), translateFile(), and translateLineCol(). Definition at line 1173 of file SourceManager.cpp. References getColumnNumber(), getDecomposedSpellingLoc(), and isInvalid(). Definition at line 1343 of file SourceManager.cpp. References getDecomposedSpellingLoc(), getLineNumber(), and isInvalid(). Referenced by ShouldDiagnoseEmptyStmtBody(), and clang::CoverageSourceInfo::SourceRangeSkipped(). This is the place where the characters that make up the lexed token can be found. Definition at line 1167 of file SourceManager.h. Referenced by clang::TokenConcatenation::AvoidConcat(), disambiguateSpellingInScope(), clang::TextNodeDumper::dumpLocation(), clang::TypedefNameDecl::getAnonDeclWithTypedefName(), clang::Lexer::GetBeginningOfToken(), GetFirstChar(), clang::Lexer::getImmediateMacroName(), clang::Lexer::getImmediateMacroNameForDiagnostics(), clang::StringLiteral::getLocationOfByte(), getRangeSize(), getStrlenExprArg(), clang::Lexer::isAtEndOfMacroExpansion(), clang::diff::isNodeExcluded(), IsStringPrefix(), mapDiagnosticRanges(), clang::Sema::notePreviousDefinition(), clang::SourceLocation::print(), clang::edit::Commit::replaceText(), SelectDigraphErrorMessage(), shouldIgnoreDueToReservedName(), clang::CoverageSourceInfo::SourceRangeSkipped(), and clang::Preprocessor::SplitToken(). Location of the top-level macro caller. Definition at line 969 of file SourceManager.cpp. Referenced by DiagnoseNullConversion(), and clang::edit::Commit::replaceText(). Definition at line 1623 of file SourceManager.h. Definition at line 1509 of file SourceManager.h. Initialize this source manager suitably to replay the compilation described by Old. Requires that Old outlive *this. Definition at line 360 of file SourceManager.cpp. References clang::FileID::isInvalid(), clang::SrcMgr::ContentCache::IsSystemFile, clang::SrcMgr::ContentCache::IsTransient, clang::SrcMgr::ContentCache::OrigEntry, and clang::SrcMgr::ContentCache::replaceBuffer(). Returns true if the given MacroID location points at the character end of the immediate macro expansion. MacroEnd If non-null and function returns true, it is set to the character end location of the immediate macro expansion. Definition at line 1051 of file SourceManager.cpp. References clang::SrcMgr::SLocEntry::getExpansion(), clang::SrcMgr::ExpansionInfo::getExpansionLocEnd(), clang::SrcMgr::ExpansionInfo::getExpansionLocStart(), getFileID(), clang::SourceLocation::getLocWithOffset(), getSLocEntry(), clang::SrcMgr::SLocEntry::isExpansion(), isInFileID(), clang::FileID::isInvalid(), clang::SrcMgr::ExpansionInfo::isMacroArgExpansion(), clang::SourceLocation::isMacroID(), and clang::SourceLocation::isValid(). Returns true if the given MacroID location points at the beginning of the immediate macro expansion. MacroBegin If non-null and function returns true, it is set to the begin location of the immediate macro expansion. Definition at line 1016 of file SourceManager.cpp. References getDecomposedLoc(), clang::SrcMgr::SLocEntry::getExpansion(), clang::SrcMgr::ExpansionInfo::getExpansionLocStart(), getSLocEntry(), clang::SrcMgr::SLocEntry::isExpansion(), clang::FileID::isInvalid(), clang::SrcMgr::ExpansionInfo::isMacroArgExpansion(), clang::SourceLocation::isMacroID(), and clang::SourceLocation::isValid(). Referenced by CheckMoveOnConstruction(), and clang::Lexer::isAtStartOfMacroExpansion(). Definition at line 1591 of file SourceManager.h. Determines the order of a source location and a source location offset in the "source location address space". Definition at line 1599 of file SourceManager.h. true if LHS source location comes before RHS, false otherwise. Definition at line 1989 of file SourceManager.cpp. References getBuffer(), getDecomposedLoc(), isInTheSameTranslationUnit(), and clang::SourceLocation::isValid(). Referenced by clang::format::AffectedRangeManager::affectsCharSourceRange(), comparePiece(), clang::StmtSequence::contains(), diagnoseRepeatedUseOfWeak(), disambiguateSpellingInScope(), clang::PPConditionalDirectiveRecord::findConditionalDirectiveRegionLoc(), clang::MacroDirective::findDirectiveAtLoc(), clang::ASTReader::FindExternalLexicalDecls(), clang::FunctionDecl::getReturnTypeSourceRange(), clang::PreprocessingRecord::isEntityInFileID(), clang::PPConditionalDirectiveRecord::CondDirectiveLoc::Comp::operator()(), clang::format::WhitespaceManager::Change::IsBeforeInFile::operator()(), clang::PPConditionalDirectiveRecord::rangeIntersectsConditionalDirective(), removePunyEdges(), and clang::LexicallyOrderedRecursiveASTVisitor< Derived >::TraverseDeclContextHelper(). Definition at line 922 of file SourceManager.h. Referenced by disableFileContentsOverride(), and clang::ASTReader::resolvePendingMacro(). Definition at line 1458 of file SourceManager.h. Given a specific FileID, returns true if Loc is inside that FileID chunk and sets relative offset (offset of Loc from beginning of FileID) to relativeOffset. Definition at line 1481 of file SourceManager.h. Referenced by clang::Lexer::getImmediateMacroName(), clang::Lexer::getSourceText(), isAtEndOfImmediateMacroExpansion(), isPreprocessedEntityIfInFileID(), makeRangeFromFileLocs(), clang::CoverageSourceInfo::SourceRangeSkipped(), and translateLineCol(). Returns whether the PresumedLoc for a given SourceLocation is in the main file. This computes the "presumed" location for a SourceLocation, then checks whether it came from a file other than the main file. This is different from isWrittenInMainFile() because it takes line marker directives into account. Definition at line 1486 of file SourceManager.cpp. References clang::LineTableInfo::FindNearestLineEntry(), getDecomposedExpansionLoc(), clang::SrcMgr::SLocEntry::getFile(), clang::SrcMgr::FileInfo::getIncludeLoc(), getSLocEntry(), clang::SrcMgr::FileInfo::hasLineDirectives(), clang::SrcMgr::SLocEntry::isFile(), and clang::SourceLocation::isInvalid(). Referenced by clang::CodeGen::CodeGenPGO::assignRegionCounters(), CheckUnreachable(), clang::Preprocessor::getModuleForLocation(), clang::Preprocessor::getModuleHeaderToIncludeForDiagnostics(), isConfigurationPattern(), clang::ento::AnalysisManager::isInCodeFile(), clang::diff::isNodeExcluded(), clang::Preprocessor::LookupFile(), and printLocation(). Return true if both LHS and RHS are in the local source location address space or the loaded one. If it's true and RelativeOffset is non-null, it will be set to the offset of RHS relative to LHS. Definition at line 1322 of file SourceManager.h. Returns true if Loc is inside the [Start, +Length) chunk of the source location address space. If it's true and RelativeOffset is non-null, it will be set to the relative offset of Loc inside the chunk. Definition at line 1297 of file SourceManager.h. Definition at line 1453 of file SourceManager.h. Referenced by clang::Sema::ActOnComment(), clang::ASTContext::addComment(), clang::CodeGen::CodeGenPGO::assignRegionCounters(), clang::Sema::CheckEquivalentExceptionSpec(), clang::Sema::checkInitMethod(), clang::Preprocessor::CheckMacroName(), clang::Sema::CheckVirtualDtorCall(), DiagnoseNamespaceInlineMismatch(), EmitDiagForCXXThrowInNonThrowingFunc(), clang::PPConditionalDirectiveRecord::findConditionalDirectiveRegionLoc(), clang::index::generateUSRForMacro(), clang::Preprocessor::getModuleMacro(), clang::ento::MemRegionManager::getVarRegion(), clang::TemplateDeclInstantiator::InstantiateTypedefNameDecl(), clang::ento::CallEvent::isInSystemHeader(), clang::Sema::isLibstdcxxEagerExceptionSpecHack(), isLibstdcxxPointerReturnFalseHack(), clang::sema::AnalysisBasedWarnings::IssueWarnings(), clang::Preprocessor::LookUpIdentifierInfo(), clang::Sema::makeUnavailableInSystemHeader(), clang::Sema::maybeAddCUDAHostDeviceAttrs(), mayInlineDecl(), clang::edit::Commit::replaceText(), shouldIgnoreDueToReservedName(), and toLevel(). Definition at line 1463 of file SourceManager.h. Referenced by AnalyzeCompoundAssignment(), CheckImplicitConversion(), and clang::Sema::diagnoseZeroToNullptrConversion(). Determines whether the two decomposed source location is in the same translation unit. As a byproduct, it also calculates the order of the source locations in case they are in the same TU. Pair of bools the first component is true if the two locations are in the same TU. The second bool is true if the first is true and LOffs is before ROffs. Definition at line 2043 of file SourceManager.cpp. References clang::InBeforeInTUCacheEntry::clear(), clang::InBeforeInTUCacheEntry::getCachedResult(), clang::InBeforeInTUCacheEntry::isCacheValid(), MoveUpIncludeHierarchy(), clang::InBeforeInTUCacheEntry::setCommonLoc(), and clang::InBeforeInTUCacheEntry::setQueryFIDs(). Referenced by compareCrossTUSourceLocs(), and isBeforeInTranslationUnit(). Definition at line 1691 of file SourceManager.h. Referenced by clang::Preprocessor::EnterMainSourceFile(), and clang::VerifyDiagnosticConsumer::HandleDiagnostic(). Definition at line 1681 of file SourceManager.h. Definition at line 1697 of file SourceManager.h. Definition at line 1686 of file SourceManager.h. Referenced by clang::ASTUnit::addFileLevelDecl(), clang::ASTWriter::getDeclID(), and clang::PreprocessingRecord::isEntityInFileID(). Tests whether the given source location represents a macro argument's expansion into the function-like macro definition. StartLoc If non-null and function returns true, it is set to the start location of the macro argument expansion. Such source locations only appear inside of the expansion locations representing where a particular function-like macro was expanded. Definition at line 995 of file SourceManager.cpp. References clang::SrcMgr::SLocEntry::getExpansion(), clang::SrcMgr::ExpansionInfo::getExpansionLocStart(), getFileID(), getSLocEntry(), clang::SrcMgr::ExpansionInfo::isMacroArgExpansion(), and clang::SourceLocation::isMacroID(). Referenced by checkLocForMacroArgExpansion(), clang::Lexer::GetBeginningOfToken(), getBufferData(), clang::Lexer::getImmediateMacroNameForDiagnostics(), getMacroArgExpansionFileIDs(), clang::ASTContext::getRawCommentForDeclNoCache(), getStrlenExprArg(), getTopMacroCallerLoc(), isFunctionMacroExpansion(), and retrieveMacroLocation(). Tests whether the given source location represents the expansion of a macro body. This is equivalent to testing whether the location is part of a macro expansion but not the expansion of an argument to a function-like macro. Definition at line 1008 of file SourceManager.cpp. References clang::SrcMgr::SLocEntry::getExpansion(), getFileID(), getSLocEntry(), clang::SrcMgr::ExpansionInfo::isMacroBodyExpansion(), and clang::SourceLocation::isMacroID(). Referenced by IsInAnyMacroBody(), and isOriginMacroBody(). Definition at line 1610 of file SourceManager.h. Definition at line 1435 of file SourceManager.h. Definition at line 1441 of file SourceManager.h. This check ignores line marker directives. Definition at line 1430 of file SourceManager.h. Referenced by clang::CreateModernObjCRewriter(), clang::CreateObjCRewriter(), IsFromSameFile(), and clang::RewriteMacrosInInput(). Returns true if the spelling locations for both SourceLocations are part of the same file buffer. Definition at line 1422 of file SourceManager.h. Referenced by IsFromSameFile(), removePunyEdges(), and updateConsecutiveMacroArgTokens(). Definition at line 1447 of file SourceManager.h. Definition at line 1643 of file SourceManager.h. Definition at line 1633 of file SourceManager.h. Referenced by AllocateLoadedSLocEntries(), emitBlob(), getFileIDSize(), clang::PreprocessorLexer::PreprocessorLexer(), translateFile(), and translateLineCol(). SourceFile the source file whose contents will be overridden. Buffer the memory buffer whose contents will be used as the data in the given source file. DoNotFree If true, then the buffer will not be freed when the source manager is destroyed. Definition at line 628 of file SourceManager.cpp. Referenced by InitializeFileRemapping(), and clang::CompilerInstance::InitializeSourceManager(). Definition at line 907 of file SourceManager.h. Override the given source file with another one. SourceFile the source file which will be overridden. NewFile the file whose contents will be used as the data instead of the contents of the given source file. Definition at line 640 of file SourceManager.cpp. Definition at line 2097 of file SourceManager.cpp. Definition at line 785 of file SourceManager.h. Referenced by compileModuleImpl(), and prepareToBuildModule(). Definition at line 944 of file SourceManager.h. Definition at line 1665 of file SourceManager.h. Specify that a file is transient. Definition at line 664 of file SourceManager.cpp. Definition at line 797 of file SourceManager.h. Referenced by clang::CompilerInstance::InitializeSourceManager(), and clang::ento::ModelInjector::ModelInjector(). Definition at line 779 of file SourceManager.h. Set the number of FileIDs (files and macros) that were created during preprocessing of FID, including it. Definition at line 1029 of file SourceManager.h. Set true if the SourceManager should report the original file name for contents of files that were overridden by other files. Definition at line 765 of file SourceManager.h. Definition at line 802 of file SourceManager.h. Get the FileID for the given file. If the source file is included multiple times, the FileID will be the first inclusion. Definition at line 1566 of file SourceManager.cpp. References getActualFileUID(), clang::SrcMgr::FileInfo::getContentCache(), clang::SrcMgr::SLocEntry::getFile(), getLoadedSLocEntry(), getLocalSLocEntry(), clang::FileEntry::getName(), getSLocEntry(), clang::SrcMgr::SLocEntry::isFile(), clang::FileID::isInvalid(), clang::FileID::isValid(), loaded_sloc_entry_size(), local_sloc_entry_size(), and clang::SrcMgr::ContentCache::OrigEntry. If the source file is included multiple times, the source location will be based upon the first inclusion. If the source file is included multiple times, the source location will be based upon an arbitrary inclusion. Definition at line 1552 of file SourceManager.cpp. Get the source location in. Returns null location if FID is not a file SLocEntry. FID is not a file SLocEntry. Definition at line 1681 of file SourceManager.cpp. References ComputeLineNumbers(), clang::SrcMgr::ContentCache::getBuffer(), clang::SrcMgr::FileInfo::getContentCache(), getDecomposedLoc(), clang::SrcMgr::SLocEntry::getExpansion(), clang::SrcMgr::ExpansionInfo::getExpansionLocStart(), clang::SrcMgr::SLocEntry::getFile(), getFileIDSize(), clang::SrcMgr::FileInfo::getIncludeLoc(), clang::SourceLocation::getLocWithOffset(), clang::SrcMgr::SLocEntry::getOffset(), getSLocEntry(), clang::SrcMgr::ExpansionInfo::getSpellingLoc(), clang::SrcMgr::SLocEntry::isFile(), clang::SourceLocation::isFileID(), isInFileID(), clang::FileID::isInvalid(), clang::SourceLocation::isInvalid(), clang::SrcMgr::ExpansionInfo::isMacroArgExpansion(), clang::FileID::isValid(), local_sloc_entry_size(), clang::SrcMgr::ContentCache::NumLines, and clang::SrcMgr::ContentCache::SourceLineCache. Referenced by buildFixItInsertionLine(), and translateFileLineCol(). True if non-system source files should be treated as volatile (likely to change while trying to use them). Definition at line 771 of file SourceManager.h. Definition at line 1721 of file SourceManager.h. Definition at line 1722 of file SourceManager.h.